Shaving Foam with rich lather that helps protect the skin while shaving. Lubricants provide a smooth glide. Hydrates the hair for easy cutting. Lightly Fragranced to refresh. Formulatd with Aloe. Hydrates the hair for easy cutting. Lightly Fragranced to refresh. 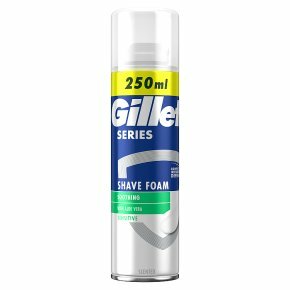 Gillette Series Sensitive Shaving Foam delivers protection and a smooth shave.Go easy on your sensitive skin with Gillette Series Sensitive Shaving Foam. The formulation, with aloe, provides 3x protection for your shave. The foam hydrates your hair for easy shaving and the rich lather protects your skin, while the lubricants provide a smooth glide. You get a shave that's clean and skin that's smooth.